Warren James Hardie Siding | Warren James Hardie | Warren James Hardy Siding | Warren James Hardie Fiber Cement SidingMcGlinch & Sons CO.
Back in 1917, McGlinch & Sons Co. Home Improvements has been supplying the most substantial James Hardie Siding that our Greater Detroit Metropolitan Area and Southern Michigan customers are searching for! McGlinch & Sons is a renowned family-owned business providing four generations of expertise for this industry. Our primary concern and a main contributing component of our amazing customer service are 97 years of being in this business. We are recognized for our knowledge and the products and solutions we carry just like, James Hardie Siding and various areas of exterior construction. To provide some charm, protection and durability to your home while also improving your homes value, then James Hardie brand is your solution! America’s #1 Brand of Siding is James Hardie, and we provide it here at McGlinch & Sons! James Hardie Fiber Cement Siding is resilient to anything Mother Nature throws its way, and many people really need to shield their homes. So when the individuals of Warren are looking for James Hardie Siding products, they contact us because we have a plethora of alternatives for everyone’s tastes! HardiePanel Vertical Siding (standard board-and-batten appearance). When you have James Hardie Siding on your home, you won’t have to worry about any damage. As Hurricane Sandy exhibited to individuals on the Eastern Seaboard, James Hardie Siding is hurricane proof and can secure your home from Michigan’s critical hailstorms, windstorms, and tornadoes that can really damage homes. McGlinch & Sons’ James Hardie Siding will go over and above what vinyl and wood siding is able to do! James Hardie Siding is also fade-resistant, nonflammable and weather-resistant, plus it’s five times wider than vinyl! It puts a stop to dampness and decay from rain, snow and humidity. And, because its impact resistance towards hail and windblown particles, James Hardie Fiber Cement Siding meets building codes for homes developed in tornado, hurricane and wildfire-prone regions. Buying a one-siding fits-all kind of product is not the best option, so contact McGlinch & Sons at: (248) 987-6300, and we can assist you. 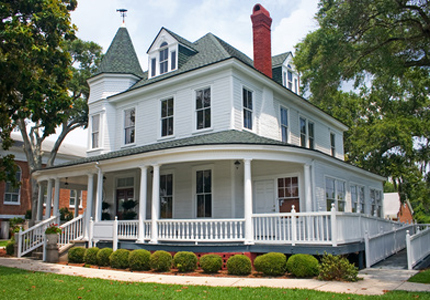 With James Hardie Siding, scraping and repainting is a thing in history!